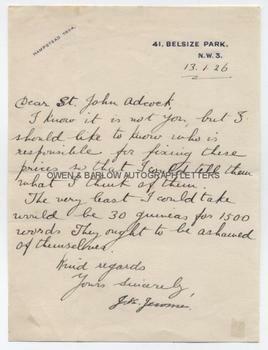 JEROME K JEROME Letter Signed. Jerome Klapka Jerome. English novelist and humourist. Author of 'Three Men in a Boat'. LS. (The text of the letter is in the hand of Jerome's secretary and amanuensis but the signature is his). 1p. 41 Belsize Park, NW3. 13th January 1926. To [Arthur] St John Adcock. "I know it is not you, but I should like to know who is responsible for fixing these prices, so that I could tell them what I think of them. The very least I could take would be 30 guineas for 1500 words. They ought to be ashamed of themselves. Kind regards, yours sincerely, J.K. Jerome." 8vo. 18 x 13 cms (7 x 5.25 inches). Slight mounting traces to corners of verso, else fine. A heartfelt rant from the 67 year old author of 'Three Men in a Boat' to the writer, critic and editor of the literary periodical, 'The Bookman', Arthur St John Adcock. It appears that Jerome had offered a piece for the periodical but was none too pleased with the paltry sum offered - a feeling with which many writers will be all too familiar. Jerome K. Jerome suffered a paralytic stroke the following year and died whilst on a tour of Devon.